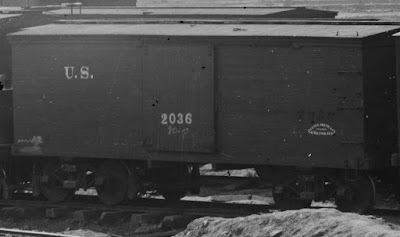 Though most photos from the USMRR show freight cars equipped with wood beam trucks, there were also a good number of arch bar trucks in use too. I used some SMR trains brass arch bar trucks on one of my flat cars. But when I checked his web site recently to order some more, I learned that they were discontinued. So I tried to make some of my own. I used the arch bars visible on the car in the prototype photo at the top left as a guide. After a few nights of experimenting I was able to develop a design that looks good, are reasonably sturdy and have working brakes. The trucks are somewhat less work to assemble compared to my wood ones, as there are fewer NBWs to install. However, the laser cut acrylic side frames are very fragile. They need to have a piece of brass bar epoxied along the bottom to provide stiffness. Example of how brake beams are suspended from the car frame. Adding working brakes were tricky as most early arch bar trucks had the brake beams suspended from the frame of the car. That would not work on my layout with its sharp curves. Later designs had the brakes in between the wheels. That was also not going to work if I wanted them to operate. 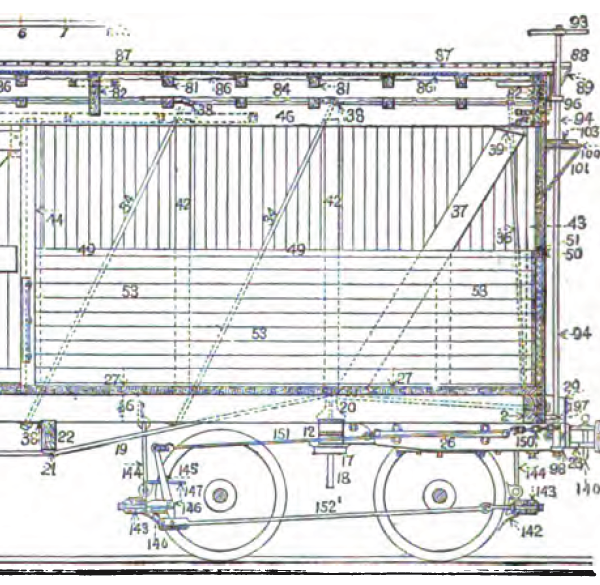 So I modified the design slightly so the brake beams hang from a safety beam inside the truck similar to the design shown on page 179 of John White's book, "The American Railroad Freight Car." I installed a set of home made arch bars on house car 1445 as shown in the photo. The truck with the brakes is the latest design. The truck on the right was the first iteration. House car with home made arch bar trucks with working brakes. Another flat car enters service with wood beam trucks and working brakes. I added a brake wheel support stand that I had seen in some prototype photos. The cannon is the latest design. The laser cut details look good. Now I just need to mass produce the barrels. I'm working on it. I was building trucks for a new batch of freight cars tonight. This is painstaking detail work. For example, each truck requires applying 24 NBWs, as well as fabricating operating brakes on half of them. While waiting for some 5 minute epoxy to cure, I took a break. I stepped into the other room, fired up the Easy DCC and took McCallum for a spin on the layout. As it chugged past Clairborne Creek, I stopped to take a snap with my iPhone. This photo illustrates the final objective appearance of the layout. But the layout can not just look good, it must run well too. I think I am getting there. I now have about 25 linear feet of the layout fully complete out of about a total 120. I predict it will take another 3 or 4 years to finish, but it is nice to have a small portion done to the final standard, with trains running with sound. 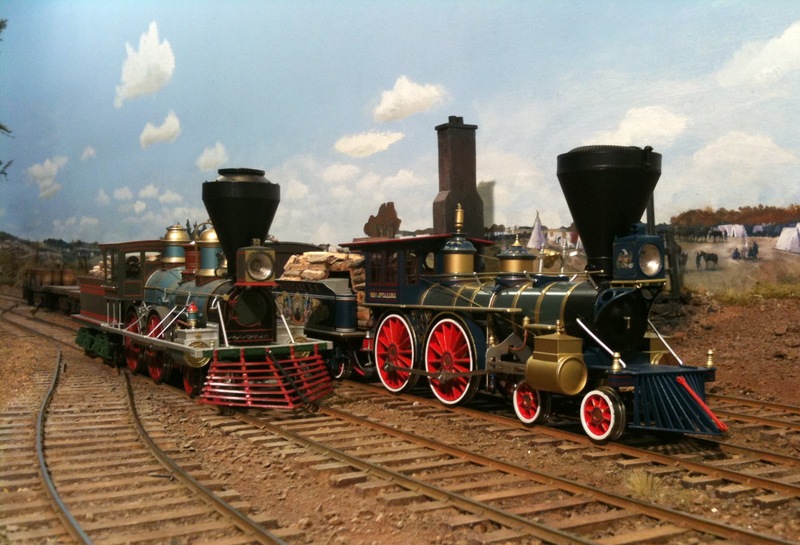 It would be great to have the golden spike ceremony before March 2013, the 150th anniversary of the line. So I better get cracking. Lt John Drye made another trip north to Pennsylvania to HMGS Historicon to recruit soldiers for the layout. He came back with 80 marching soldiers painted by professional figure painter Leonard Albright. These combined with the 40 already recruited makes 120 - a decent sized unit. I did a little photoshop work to hide the bases in this shot. 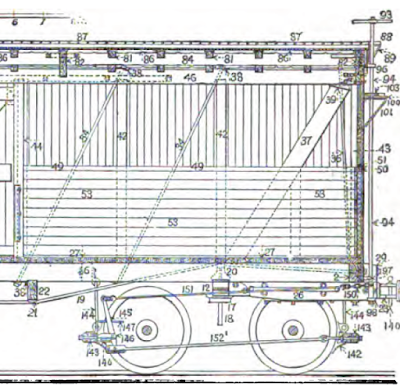 The boxcar shows how the varying scales work together. I intend to pose these between Brook and Potomac Creek. They will be marching along the backdrop. These are 28mm figures, but work well in background scenes as the first photo shows. I will remove the figures from their wargaming bases when it comes time to install them. In these shots they are posed in a double line formation. On the layout, they will be in a single 4 man column. There will only be one set of colors and it will likely be cased, i.e. rolled up and covered. The figures are mounted on 2x2 stands (bases) for use in wargaming. I'll have to pop them from the bases to pose them in column following the terrain. I'll add some wagons and mounted officers to flesh out the column. It should look cool. I may snip off the bayonets, as they probably would be in their sheaths for an non-tactical move in the railroad area. Oh, one other thing. I still have several hundred more figures to paint. It might be time to promote Lt Drye. Some new reinforcements arrived on the scene. The marching soldiers were painted by John Drye. In the background you can see the tool shed in its final location. I made the roof removable so you can see the detailed interior. I also finished placing the artillery gunners doing their gunnery drill at Battery Schaefer, which you can see in the blurry background. The Falmouth scene is almost 100 percent done. The lead soldier sure looks tired. These are 40mm Sash and Sabre figures. What's he doing up there anyway? He is an ugly chap. I painted the converted wire man that I described earlier. He is a Cannon Model Railroad figure with a Old Glory head and some Andrea Sculpt putty for a shell jacket. I haven't decided where he will finally go. Marty McGuirk and his son Jeff stopped by on Sunday after the Manassas Battle re-enactment. Jeff had not seen this layout before, though he did visit once before when I was building Tennessee Pass in N Scale. After a quick introduction, I handed them a throttle dialed in for McCallum, a coupling staff and gave them a verbal train order and switch list. I left them alone to operate while I made some operator cheat sheets for the whistle signals. After they were done, Marty and Jeff gave me a back brief on their session. The McCallum did not run perfectly, and one or two cars were dragging brakes. Clearly more tuning is in order. Given that both Brian, Marty and Jeff had trouble with McCallum, I took it to the wood shed and gave it a whupping. OK, not so much a whupping as more tuning. In the shop, I lowered the front end by trimming the spring. This returned the normal weight distribution on the engine driver wheels and now it tracks much reliably, especially at the tight curve into the turntable. But, now the rear pilot wheel was shorting on the valve guide. To solve this I painted all the parts with a coat of clear nail polish. Then I glued an insulating pad on the inside of the valve guide. I also added an insulating ring to the front of the cylinder on the same side. Viola, testing now shows no shorts or sparks on the front end. Sometimes the pilot truck axle dragged on the insulating ring when taking a tight curve, but a touch of oil helped. Lesson learned for future layouts, keep the curve radius over 36 inches. I also noticed an occasional spark from the bottom of the tender when I tested the loco in a dark room. The culprit was intermittent contact with those dang wiper screws. Three coats of nail polish on these screws have help solve the problem, for now....arrrg. All the handling of this locomotive has resulted in a few spots on the finish that needed touch up. There was a CAA glue glob on the cab roof that required sanding. Since the finish was no longer perfect I decided to weather McCallum to make it look like an in-service machine. I used washes, chalk and dry brushing to achieve the look I wanted. It's fairly heavy, but not overly done. The stack, flat roof and surfaces that get walked on got the heaviest treatment, along with the underside. McCallums's wood pile had some holes where you could see into the tender. To fill those I went to the yard and pruned some dead branches off a mountain laurel that is not enjoying our heat wave. I made some short lengths of wood to match the ones on the tender and filled the appropriate gaps. Then I gave the wood pile a black wash, some dry brushing and touch up paint to blend it together. I gave the model a shot of dull cote, taking care to keep the glass clear. Then I put a wire brush on the wheels to clean off the overspray. Back on the track McCallum is now running much better. Nearly as good as Haupt, which currently is my best runner with DCC. Factory painted wood pile in front, newly painted in the back. While I had the paints out, I decided to paint the cast resin wood pile on Haupt so it would look more realistic. I also added a few twigs from the mountain laurel to make it look different from Whiton's wood pile, which uses the same casting. I was very happy with how the casting came out. This photo compares the factory painted pile in the foreground with the newly painted and detailed pile in the back. I used a dark charcoal wash, follwed by brunt sienna, burnt umber and clay bisque paints. All got blended and applied in layers so I can't specify an exact formula. I also put a new car in service. This is Flat Car Number 24 with SMR arch bar trucks. The SMR trucks do not have working brakes, and adding them would be difficult, at least if I used the cast brass ones. I would probably have to take the cast brakes off and use wood ones that I would have to make. But the SMR arch bar trucks are quite nice and I wanted to have some on the layout. So far none of my flat cars have working brakes. I need to decide how I will handle that issue in operation sessions. Finally, I inspected the freight cars for dragging brakes. I oiled some of the journals and they did run much smoother. Just like a real RR, my journals will need occasional attention with oil. I later engraved three whistle cheat sheets and attached them to the back of each throttle with double sided adhesive. Now all you have to do it look at the back to the throttle if you forget your whistle signals. They are slightly different from what most modern operators are used to. 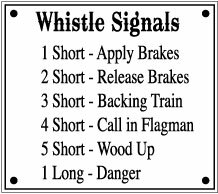 These whistle signals came from the USMRR Rule Book of 1863. One other point about the links that I have observed. The cars seem to track better in reverse with shorter links. SMR and I made links in two sizes. Given my tight radii, I thought the longer links would work better. But I think these create too much sideways thrust when backing and can result in derailed cars. The shorter links seem to do better when backing up, however, they are a little harder to manipulate when coupling. I need to evaluate this further. I visited the city of Manassas today to see some of the events they had ongoing for the 150th Anniversary of the Battle of Bull Run. I did not go to the battlefield site, but instead went to the General Officers' encampment downtown near the City Museum. I also went to Camp Manassas at Jennie Dean Park, where some artillery units were camped as well as a balloonist, sutlers and a African-American couple depicting an typical farm. The weather was hot, but not as humid as the previous days. It was fun seeing so many people in period dress. Here are some pictures and a video depicting a small cavalry charge. Brian Kammerer and Glenn LaBoeuf, one of the guest speakers, in front of Brian's art display and sales tent. Some of the CSA General Officers and their wives at the Lee's Lieutenant's camp near the Manassas Museum. There were lots of women in period dress at the event. Some of the mounted officers demonstrated a cavalry charge. The leader sure looks like Stuart. Part of an artillery battery at Camp Manassas. The balloon was not flying when I was there. The general officers had some elaborate tents. This weekend is the 150 Anniversary of the 1st Battle of Bull Run. The City of Manassas is hosting a major four day event with nearly 10,000 re-enactors, 60 cannon and hundreds of horses, mules and even some oxen. Brian Kammerer, the artist that has helped me create my backdrops with his fantastic camps scenes, will be at the reenactment displaying his civil war art work. He intends to eventually cover the whole war, but he has been working on a series of prints for the first Battle of Bull Run and they are fantastic. He also produced a series of special edition prints commemorating the 150th anniversary just for this event. Check his web site for more details. If you are at the event, please stop by and check his display. He also has a fun video for sale entitled, "The Other Great Locomotive Chase." On his way to the event, Brian spent a night at our house, where he had a chance to see the layout, offer some artistic advice, run a train and watch his video on the big screen. It was fun to listen to his comments about the making of the video as we watched it. He also had a chance to view the crude mock-up of the Aquia Landing area. I made a cardboard cut out depicting the hull of a Passiac Class ironclad ship. Brian's advice was to make the USS Passiac slightly smaller scale so it would fit in the available space. I am still not sure that I want to include the ironclad. I think a series of barges and tugs would more accurately depict this as a logistics base. A small gunboat might be a better fit. On the other hand, nothing says Civil War naval action like an ironclad Monitor style ship. One factor I must consider is access to the tracks on the wharf to allow easy uncoupling. The Passaic, being a low slung ship, would not pose too much of problem if it were in the foreground as people reach over it to uncouple. 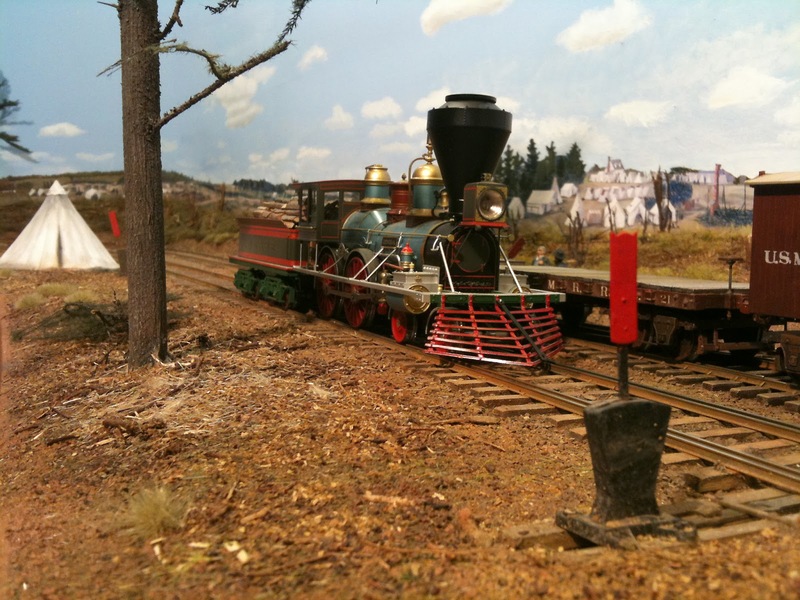 While we are hiking and enjoying the wild west of Utah, Idaho and Wyoming, I recommend you take a moment to check out Kevin Strong's blog on his garden railroad. It has some of the finest garden railway photography I have seen. Thanks to Marty McGuirk for pointing this out. While in Utah I had a chance to visit a couple hobby shops and picked up some supplies to convert the next loco to DCC. On Don Ball's recommendation, I went with a DRGW C-Class Tsumani decoder. Brad at The Train Shoppe in Salt Lake City was quite helpful. I'll install it when I get home. Don Ball has a great HO layout, The Stockton and Copperopolis, depicting the central California region in the 1890s. His website is worth a look. I continued working on the final details punch list for Falmouth. I resumed sculpting the climbing telegraph lineman for the pole, added some grain sacks, installed some guard rails and built a pump house. The telegraph lineman is based on the photo from the Civil War. It shows a soldier at the top of pole doing maintenance. Actually, in the photo it looks like he is hanging on for dear life as he poses for a picture. I can't see any tools. 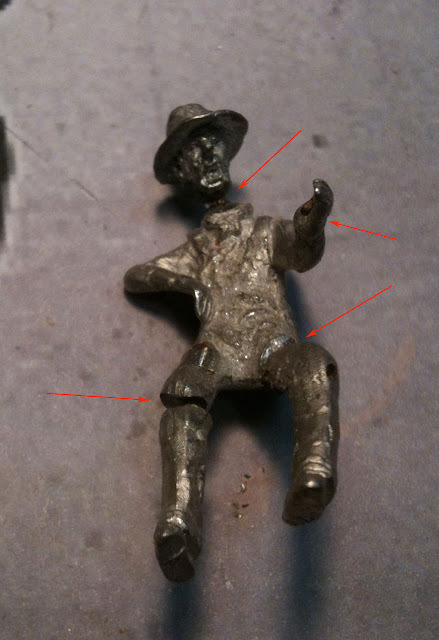 I replaced the Cannon loco engineers head, that had a typical RRer's hat, with a head from a 28mm Old Glory ACW soldier wearing a flat wide brim hat. The heads on Old Glory figures are overscale (they should be about 1/58 to 1/64th scale) and work well with 1/48 scale figures. I also converted a second figure that would be leaning on a tree watching the action. Fortunately, I have duplicates of the base figures. So I redid the pole climber. This time around I used thick CAA to reshape the joints and Andrea Sculpt to make the jacket. This went quicker. I primed the figure and test fit him on the pole. So far, so good. Now I just need to finish painting him. As I mix up small batches of putty, I usually have some left over. With these bits I made grain sacks. I will need several hundred of these so it might be worth my making a mold and casting them. The pump house is a quick scratch build using scribed board and batten siding and scale lumber. The door is a Tichy casting. The stack is also a casting. I made a sign for the house, although I don't have a prototype to go by. It makes sense that they would have a pump for the tank. The small triangular area by the water tank looked empty, so I added the pump house. Once I decide on final placement, I'll glue it down and run a pipe to the tank. Also visible in this shot is the guard rail I added to the turntable lead. This curve is very sharp and a guard rail helps keep the wheels on the rails. I also added guard rails to the other sharp curves behind the tank. The Falmouth and Clairborne Creek areas are now getting some final details. I added wooden splices to simulate the rail joints (later these would be known as Joint Bars). These 48 inch long wooden pieces use 4 square headed nut and bolts to hold sections of rail together. I cut a batch of splices on my laser using 1/16th inch think basswood. The laser engraved the nut detail saving me the tedium of applying hundreds of NBWs. Sections of rail in this era were 28 feet long. I filed small groves in the top surface of the long rail sections and then glued a splice bar on the outside of the rail. In the prototype the inside did not get a wooden splice, just the opposite end of the bolts and a small iron bar. I did not add these as they are practically invisible under the web. I touched the nut heads with a rusty red color pen. This work went fairly quickly. The result is subtle as the laser cut wood splices blend with the ground color. 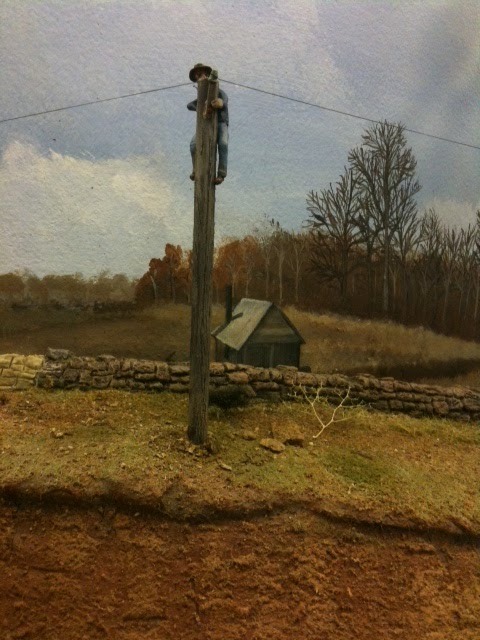 Next I added the telegraph pole line. This will start at the engine terminal shed and will extend all the way to Aquia Landing. The pole line will require a wooden poles, insulators and wire. I used 1/4 inch dowels for the poles. I roughed up the surface to simulate bark texture as these were basically logs. or linen, but not screwed. Next was the insulator. The photos of the telegraph poles at Stonesmans Station show the "hatpin" style of insulator being used with a wooden pin. I made a trip to the local craft store to find some glass beads that would make a suitable insulator. I didn't find anything that would work. So I made insulators from brass rod using my Dremel mini-lathe. I used square tooth picks for the pins. I drilled a .030 inch hole in the center of the toothpick and then glued the stub from the brass insulator into the hole. Then I glued the wooden pin to the pole. I drilled a hole through the wooden pin into the pole and then added a NBW to help secure the pin. The telegraph desk is in this shed. I painted the poles dark brown, dry brushed with grey and tan. The insulator was painted a light green while the pin got a light wood color. I installed the poles about every 18 inches. I used lycra thread to make the telegraph line. Next I want to make a figure climbing the pole like the one in the photo. I started modifying a suitable lead figure. I'll finish him in a later post. 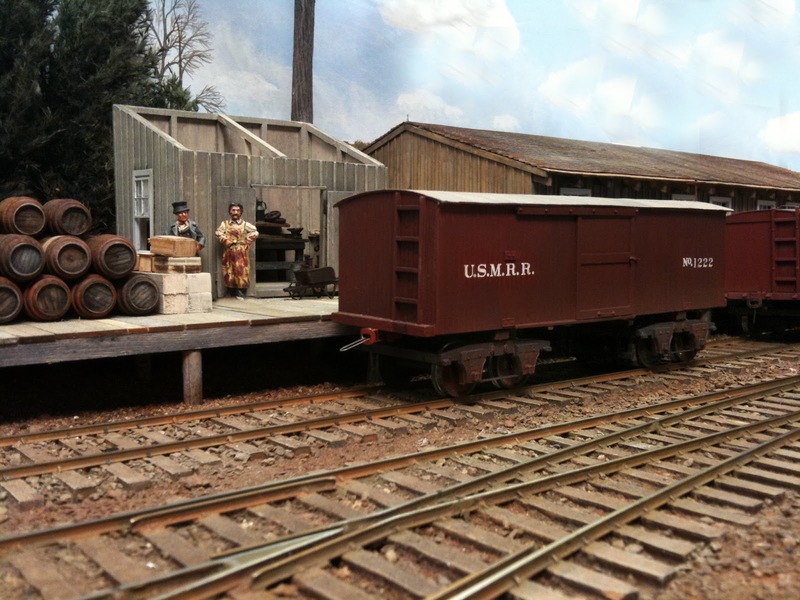 The Falmouth area of the layout is fully operational and almost completely finished with scenery. 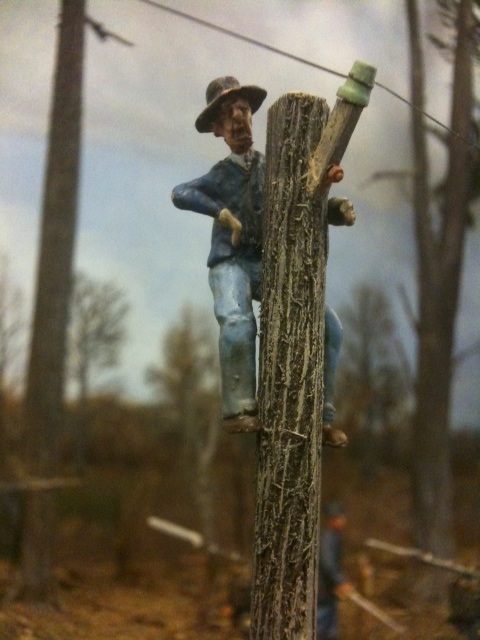 There are just a few small details left like the roof of the tool shed, installing the telegraph line and finishing the figures at Battery Schaefer. I though it would be fun to make up a switch list, build a train in the yard and take it out. This is a harbinger of what operations will be like on the model railroad. I am pleased to say that everything worked very well. The new coupler magnets work very well. They are smaller than the previous ones and don't inadvertently grab both pins. The McCallum ran well. The extra weight helped. It had no trouble working the Falmouth yard. This positive result provides motivation to continue work. Here are some iPhone snaps depicting the action. 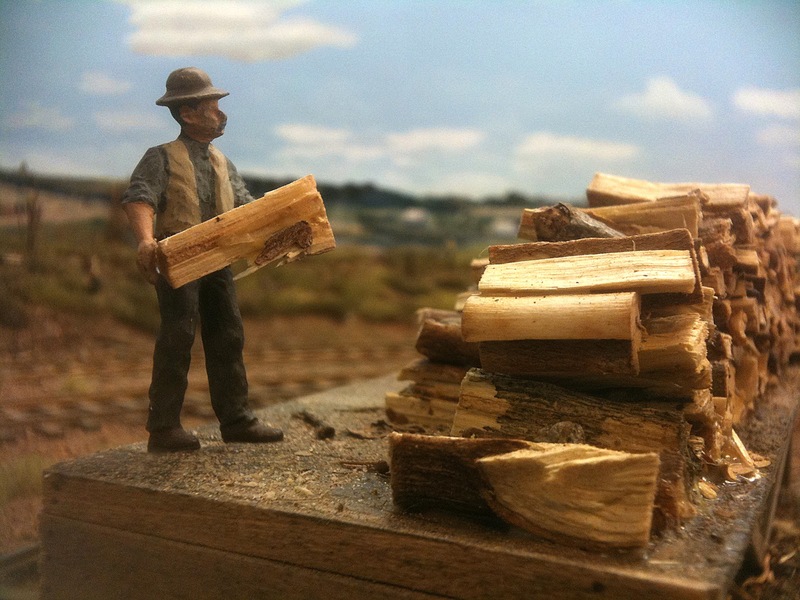 Stacking wood at the wood rick. This is a SMR fireman figure. 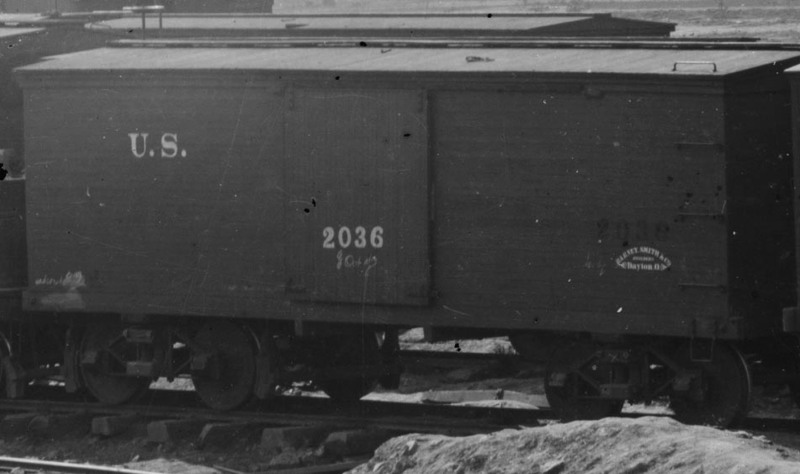 Two box cars at the freight depot in Falmouth. John Drye painted the two figures, named Doctor Franke and Mr Drye. This is a first generation switch stand that uses a laser cut base. The new ones are photoetched. Refugee freed slaves near Fredericksburg, VA.
My research shows that many former slaves sought freedom via the USMRR Aquia Line. See this post for more detail about slave experiences on the Aquia line. To try to depict and commemorate the experience I created a scene showing a family of freed slaves at Falmouth. The figures are from the Knuckleduster Women and Townsfolk sets that I painted as African Americans. I muted the colors added heavy mud weathering to simulate that these folk have been walking quite a distance to get to Falmouth. My daughter looked at the figures and said, "Dad, you made them really muddy." 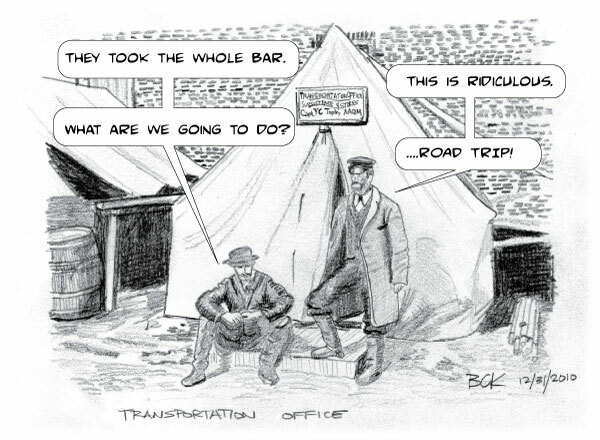 I was thinking about the characters Coalhouse Walker and Wilma from E.L. Doc torow's, "The March" when I was planning this scene, though they didn't have children in the book. By the way, "The March" is a great book that takes a personal look at Sherman's march to the sea. The mule carries all the family's worldly possessions. I made the sacks on the mule with two part epoxy. I also made a pot and skillet to hang off the mule. The mule color is a dappled gray based on a color scheme I saw in a photo I found on the web. It just occurred to me that me looks like Eyore, of Winnie the Pooh. The blanket on the box is also two part epoxy. The crate is one of my hard tack boxes. I was going to hang the box on the mule too, but it was too much. Here is the completed scene. The father gestures to the agent to show where they came from. Maybe the father will seek work on the USMRR construction corps.